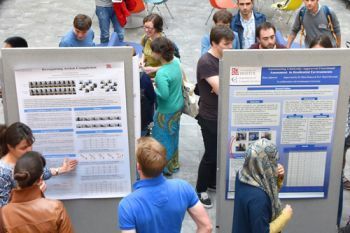 Dr Constantino Carlos Reyes-Aldasoro participated in the 21st edition of the Computer Vision Summer School, held at Swansea University. 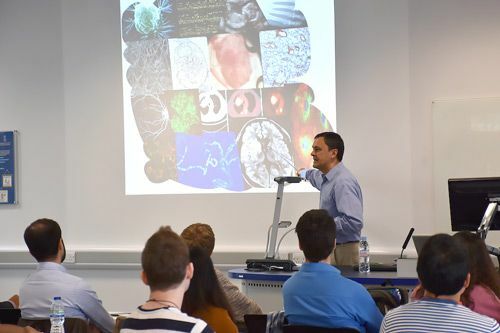 Dr Constantino Carlos Reyes-Aldasoro, a Senior Lecturer and member of the Research Centre for Biomedical Engineering, gave a lecture on Medical Imaging at the 21st edition of the Computer Vision Summer School, hosted from 4th to 8th July 2016 at Swansea University. Around 50 PhD students from the UK and abroad gathered for a week of intensive training with 16 speakers from both academia and industry giving 19 lectures, including practical sessions. The content of Dr Reyes-Aldasoro's lecture included medical technologies such as X-Rays, Magnetic Resonance Imaging (MRI), Nuclear Imaging, fluorescence and multiphoton microscopy. Examples of data sets and processing techniques were also provided. Other sessions included Segmentation, Machine Learning, Motion and Tracking, Colour, Matlab, and, of course, an excursion to the beach in Mumbles. Nuclear Imaging uses low doses of radioactive substances linked to compounds used by the body's cells or compounds that attach to tumor cells. Using special detection equipment, the radioactive substances can be traced in the body to see where and when they concentrate. Two major instruments of nuclear imaging used for cancer imaging are positron emission tomography (PET) and single photon emission computed tomography (SPECT) scanners.